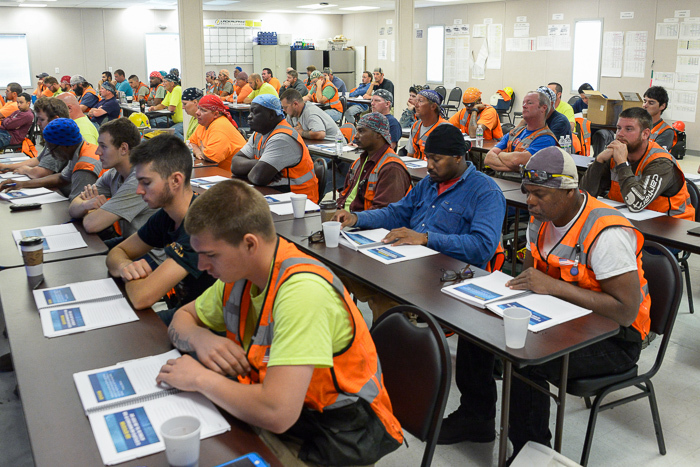 NEARLY 150 MEMBERS working at the Lackawanna Energy Center near Scranton, Pennsylvania, completed Boilermaker Code training July 19-20. Prime contractor Kiewit hosted the training at the project site. Approximately 175 Boilermakers representing 30 locals from across the United States are on the job, building elements of a new 1,500 MW combined cycle gas plant. Local 13 (Philadelphia) has jurisdiction for the Boilermakers’ work. 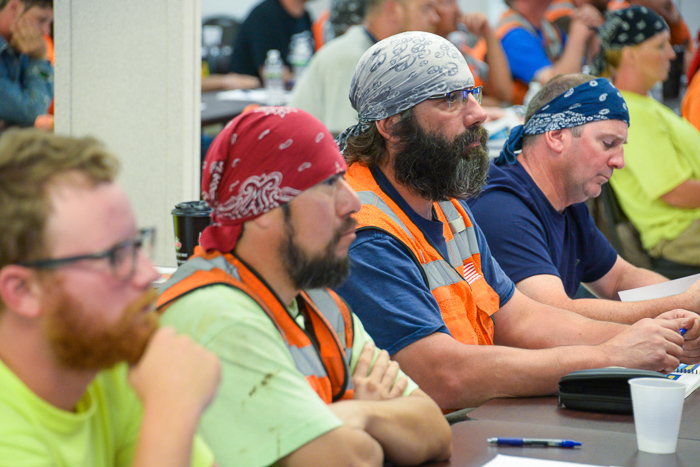 MOST instructors Pat Gallagher and Mike DiCicco taught three separate classes over two days to accommodate the large number of members and both the day and night shifts. Mobilization and Training Representative Jay Brophy provided technical support. L-13 members completing the training included Kyle Abraham, Louis Amandola, Richard F. Babcock Jr., John Becker, John Belles, Kevin Birney, Joseph Carlisle, Todd Cassar, Cillon Chichester, Tony Ciferni, Brad Coburn, Michael Cole, Erron Corke, Joseph Cusson, Paul Davies, Bradley Davis, Bernard Delsordo, Shane Diebold, Jarrett Ellis, Joshua Everetts, Dennis Feeney, Robert J. Fitzsimmons Jr., Ed Fore, Eric Fore, Chis Geld, Justin Harris, Kevin Hegarty, Raymond Hizny, Michael Isaac, Roger Jayne, Kris Keiper, Thomas Kern, Joseph Mackiewicz, Ryan Mahoney, Bryan Maneval, Vince Mangiamele, Rawk McBean, Matthew Murray, William O’Donnell Jr., Michael O’Malley, Patrick O’Malley, David Pacovsky, Nathan Pecht, Deuel Pickens, Stephen Ray, Michael Ream, Matthew Reeves, Robert C. Robinson, Ben Samson, Kurtis Samson, Dale Schaffner, Greg Shoback, Edward Storz, Anthony Vaughan, Douglas J. Vogrin, Tim Wiernusz, Francis Wilcox, Everett Wittstadt and Jason Wood. Travelers working the Lackawanna project and completing Boilermaker Code training included: Local 4 (Page, Arizona), Larry Adakai and John Sherman; Local 11 (East Helena, Montana), William Swasey; Local 26 (Savannah, Georgia), Adam Jilks; Local 27 (St. Louis), Ryan Ratcliffe; Local 29 (Boston), Gary J. Goode and Guillermo Quinones; Local 37 (New Orleans, Louisiana), Nedric Rose and Jamie Stell; Local 40 (Elizabethtown, Kentucky), Alex S. Ball, Jared Minner, Jeffery H. Phelps, Matthew M. Phelps and James Smith; Local 45 (Richmond, Virginia), Scot Bonnar, Daniel Evans, Aaron D. Harkabus, Ryan Helms, Kossi Koudonou, Larry Meyers, Houston S. Moore, Bjorn O’Brien, Earl O. Pickens, Allen G. Simmons Jr., Joseph D. Williamson, Jake Winters, Stephen Yuhas and Josh Zacharias. Also, Local 60 (Peoria, Illinois), Kristen Cooper, Jack Furgerson, Ruben Garza, Justin Olson and Joseph A. Scalf; Local 69 (Little Rock, Arkansas), Paden Brown; Local 83 (Kansas City, Missouri), Michael Craig, Kyle Day, Gregory P. Devereux, Daphne Dodd, Joshua P. Dunham, Darrell Manroe, William E. Miller III, and Edward Sargent; Local 92 (Los Angeles), Dominic Campos and Zeke Campos; Local 101 (Denver), Michael McFadden and Jessica Paris; Local 108 (Birmingham, Alabama), Eric Cooks and Ray Mealer; L-110 (Hattiesburg, Mississippi), Marcus Massion, Charles Page and Evan Weaver; Local 132 (Galveston, Texas), Joseph Shaw; Local 154 (Pittsburgh), David Campbell, Thomas Hazlip, Joel Houston and Sean Kennedy. Also, Local 242 (Spokane, Washington), Brad Crank, Michael Steber and Jared Williams; Local 263 (Memphis, Tennessee), Kevin Daniel, William D. Dunlap, Trevor Goodrum, Justin Maness, Ben Payne II, and Taylor Poor; Local 363 (East St. Louis, Illinois), Stoney Hayes; Local 374 (Hammond, Indiana), Daniel Hunt, Kevin Thomas Jr. and Kevin Thomas Sr.; Local 433 (Tampa, Florida), Samuel Findley and Stephen Vietze; Local 454 (Chattanooga, Tennessee), William C. Wheeler; Local 455 (Sheffield, Alabama), Ngozi Bell and Alan Chandler; Local 456 (Rock Hill, South Carolina), Terry Cooper; Local 549 (Pittsburg, California), Abraham Hurtado; Local 592 (Tulsa, Oklahoma), Tony Yackley; and Local 667 (Charleston, West Virginia), Jonathan Jenkins and Adam Pavlisin.